Mosaic is a sort of pattern or picture made of colored stones, smalt or ceramic tile. Mosaic can be percept as a glorious palette of colored wood, glass and stones. Mosaic art tradition had started at antique period (Roman and Byzantine styles). During the period of Late Empire mosaic was used in decoration of private and social buildings. Since age XII Florentine mosaic is making of one plate positioned sheets of variable colored marble and jasper trimmed carefully in a wide range of shades and forms. The concept was borrowed from the intarsia tradition (a sort of incrustation applied in furniture design. Florentine masters were the first to apply natural fret of the stone for finished artifacts. A special technique for mosaic was elaborated up to the end of XVI century and had never changed seriously up to our days. Florentine mosaic is a unique brand ( that a sort of picture painted by stones, by a unique selection of colors and shades basing on natural pattern. Russian tradition of mosaic had started in Ural Region in XVIII century. The first masters had used valuable but never blocked rock breeds (malachite, lazurite, Kushkuldin jasper). As a basic plate they'd used turner produced forms of cutter stone or plate. To decorate it's possible to use not only marble or jasper but also semiprecious stones of Ural such as charoite, agate, aventurine, amazonite, onyx, ophicalcite, rhodonite, serpentine, fluoride. Mosaic was used to decorate not only flush walls and domes but also as an element of various architectural details and decorations with complex form and surface (vases, bowls, casket boxes). 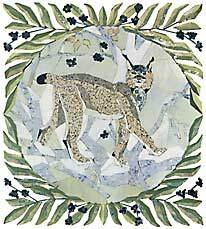 The art of Florentine mosaic is alive. Old traditions are developed by contemporary masters. Application of modern diamond tools and polishers makes possible to receive the quality of stone processing that was impossible before. Master Alexander Lipin (Moscow, Russia) offers the manufacture of various decorations in Florentine style on the base of Ural gems to ornament residential and office buildings with floor or wall panels, table plates and other decorative elements. It's also possible to decorate bathrooms and swimming pools. I allow the copies of world famous painting masterpieces in the technique of Florentine mosaic. Your special ideas (still life, scenery, portrait, arms, multi-figure compositions etc.) are also welcome. All the works will be unique.